For the last month of the spring semester, I had the opportunity to test out the Motorola XOOM, Google’s tablet competitor to Apple’s iPad 2. Full disclosure: Before I received the XOOM in the mail, I didn’t see how a tablet would fit into my work flow. When I’m in my dorm, in class or doing work elsewhere, I’m on my laptop. When I’m on the go, I’m on my smartphone. There’s no in-between for me. After seizing my free opportunity to test out a tablet, my work flow hasn’t changed, but I recognized how tablets could make a good fit for others. Michael Murphy, a spokesperson for Verizon Wireless, cited QuickOffice and Google Docs as word processing applications that make XOOM a device for presenting and producing content, the latter being a key component for college students to consider. The key reason the XOOM (or any tablet) doesn’t fit into my work flow is its keyboard. Its size prevents me from typing at full speed, and if I were to go out and buy an external keyboard, or even a virtual keyboard, I’d be defeating the purpose of a tablet: portability. I’d prefer to use my laptop. But once I finished all the work I have to do and had some leisure time, I had a hard time putting down the XOOM. With that being said, I now will proceed with a complete review of the XOOM, and provide some info on its competitors. 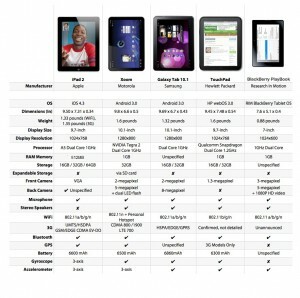 To the right is a complete chart of the specs between the five major tablets on the market with the iPad 2 and XOOM leading the pack. XOOM is clearly meant to be used landscape style, as it is slightly wider and much shorter than the iPad 2. The iPad 2’s main use is portrait style. The location of the front camera on both devices distinguishes the two viewing styles, but both devices run smoothly either way. The amount of RAM and weight are a couple of notable differences between the iPad 2 and XOOM. The XOOM has twice as much RAM as the iPad 2, but is about a quarter of a pound heavier. Multimedia consumption generally is a plus for all tablets, and the XOOM is no different. Its display is phenomenal, the fact that you are holding it and can literally flip through photos still fascinates first-time users, and its portability makes it great for viewing anywhere. Google revamped its music application interface, giving it a similar user experience to Apple’s. Now the XOOM app is attractive but still very intuitive, which are two attributes that make the iPad 2 a top seller. I would still give the edge to iPad 2 in this department only because it is so easy to synchronize with iTunes, which is more widely used and far superior to Windows Media Player. Angry Birds. Angry Birds. Angry Birds. Need I say more? Angry Birds is one of the most popular games now, and after playing it on mobile, tablet and laptop, I can tell you the best nest lies in the tablet. The hands-on feel and beautiful display make it the ultimate in-class distraction. Another popular game, Words With Friends, is also a great fit for the XOOM. Web browsing wasn’t as instant as it seemed on the commercials, but it wasn’t slow by any means on a good wireless and 3G connection. One thing I was shocked to discover was that the XOOM didn’t come ready supporting Flash, which is a clear advantage over Apple’s products. Once I manually installed Flash so my browser could display Flash elements, everything changed. According to some developers, HTML5 could replace Flash, but these conversations have been going on for more than a year and it doesn’t look like major changes will happen anytime soon. If it does, Apple products will be ready to support it and match Android’s Web functionality. The XOOM has a ton of customization options, but the interface as a whole is not nearly as intuitive as the iPad 2. Starting with the location of the power button (on the back of the device next to the camera), to the unclear buttons along the bottom and top edges of the interface, it evokes a nerdy feel. The iPad 2’s interface is so simplistic that I’m confident even people who repel technology could operate it without any questions. I happen to prefer the XOOM’s advanced look because I enjoy figuring out what every button does and learning the best ways to operate the device. In fact, I think its advanced look and customization gives it an edge over the iPad 2. But if you are looking for ease of use, I would suggest trying the iPad 2. Many people compare iOS device and Android device, they never compare the OS upgrade problem. For those people using Android device, for example, Samsung Galaxy Tab user, do they get 3.1 just like the Xoom user? They probably have to beg the manufacturer to cook a new version of the OS for them while this was never the case( at least until now) for Apple user! Manufacturer like HTC, SE, etc, they all have bad history in releasing new version of the OS for Android and Windows Mobile. I had both of these for two weeks and the iPad 2 won because the 3.0 Honeycomb was glitchy, many apps would not load or operate on the Xoom and the forthcoming upgrades were nowhere in sight before my trial period ended. However, I loved the Xoom’s browser, email and Google integration. I would have loved to keep it but the iPad just worked even though simplistic and limited in customization. i dont think the competitors have much of a chance to be honest.